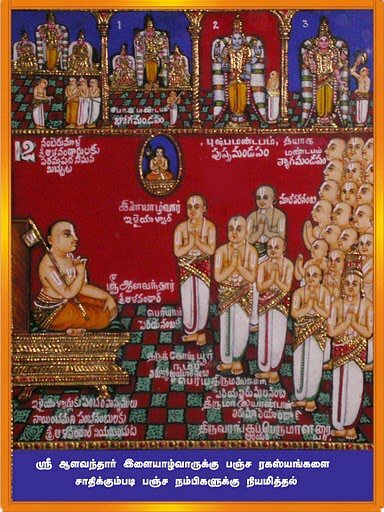 maNavALa mAmunigaL identifies that our SrIvaishNava sampradhAyam is emperumAnAr (rAmAnuja) dharisanam as declared by namperumAL (SrIranganAthan). Together we can explore the depths of this glorious sampradhAyam in this blog site. This website is a humble samarpaNai at mAmunigaL's ponnadi (his thiruvadi [lotus feet] is called ponnadiyAm sengamalam - representing ponnadikkAl jIyar - 1st pontiff of vAnamAmalai/thOthAdhri mutt). When NammAzhwAr, out of his kAruNyam, was teaching thiruvAimozhi to nAthamunigaL (nAthamunigaL recited kaNNinuN chiruthAmbu 12000 times at once and pleased NammAzhwAr who taught him aruLicheyal and all the meanings along with ashtAnga yOgam), during 5.2.1 - "poliga poliga" (பொலிக பொலிக) meaning glories! glories!, since AzhwAr was thrikAlagya (one who knows past, present and future) based on emperumAn's mercy, he reveals the divine avathAram of udayavar to nAthamunigaL and says "kaliyum kedum kanNdu konNmin" (கலியும் கெடும் கண்டு கொண்மின்) meaning kali will be destroyed. AzhwAr further says "A great personality is going to appear in this prapanna kulam. The whole world is going to be uplifted by him" to nAthamunigaL. Hearing this nAthamunigaL becomes ecstatic. Wanting to know more, he adds music to "payananRAgilum" (பயனன்றாகிலும்) pAsuram from kaNNinuN chiruthAmbu (10) and sings the same in front of AzhwAr, pleasing him very much and asks him "Since you are sarvagyar you will know everything. Please demonstrate the physical beauty of that great personality". In the night, AzhwAr appears in nAthamunigaL's dream with kAshAyam, thridhaNdam, dvAdhasa Urdhva puNdrams, beautiful long hands, very beautiful glowing thirumEni, etc. He has beautiful face which indicates the flowing mercy, a beautiful smile and red eyes (showing vAthsalyam - motherly forbearance) and tells nAthamunigaL that this is how udayavar will look like and all members of this prapanna kulam will benefit by their connection to udayavar. Suddenly nAthamunigaL wakes up from his sleep and immediately prostrates in front of AzhwAr and tells him that AzhwAr's presentation as udayavar is more attractive than AzhwAr's svayam (original) thirumEni (form). AzhwAr replies to him saying "that is no surprise, as the whole world is going to be attracted towards udayavar". nAthamunigaL subsequently asks AzhwAr how to constantly worship this bhavishyadhAchAryan (future AchAryan) form? 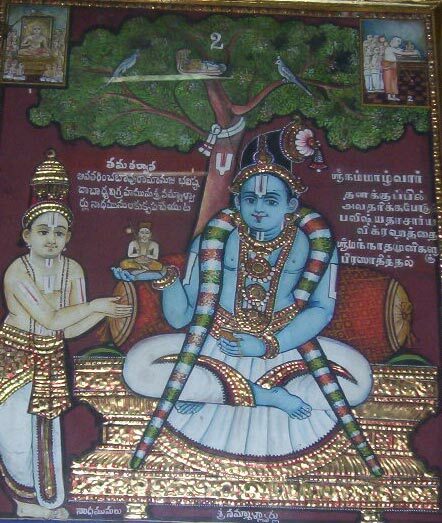 AzhwAr appears in the dream of a sculptor as bhavishyadhAchAryan and orders him to make a vigraham (uthsava mUrthy) sitting under the divine tamarind tree. The sculptor arrives there the next morning and without break spends time at constructing this thirumEni (as seen in the dream). Once the vigraham is built, AzhwAr installs divine powers in that vigraham, invites nAthamunigaL and presents him that vigraham. He tells nAthamunigaL, "just like iLaya perumAL (lakshmaNan) is considered as the right hand of perumAL (srI rAman), think about this bhavishyadhAchAryan as my part (lotus feet)". He also says "Since I am the origin for this bhavishyadhAchAryan, he will also be my lotus feet, he will fulfill all my desires. In your family, we are going to see one person who will meet this bhavishyadhAchAryan directly. This person will appear in the same month as when srI rAman's pattAbhishEkam was due (chithirai) and like gIthai (which contains 18 adhyAyams) revealed emperumAn's upAyathvam, this person will appear on the 18th nakshathram (thiruvAdhirai) from my own (visAkam). You worship this vigraham like you worship myself" and gives him a farewell to kAttu mannAr kOil. periyavAchAn piLLai often mentions that "At that time nAthamunigaL compiles and recites the following slOkam out of upakAra smruthi towards AzhwAr." I surrender unto nammAzhwAr who is the son of kAri and who showed me the divine form of bhavishyadhAchAryan in my dream of his unlimited grace. Also, periyavAchAn piLLai tells that this was kept as top secret and was revealed through OrAN vazhi only to the most confidential disciples. Thus nAthamunigaL learnt all the 4000 dhivya prabhandhams and returned to vIranArAyaNa puaram (kAttu mannAr kOil). He recited the dhivya prabhandhams in front of mannanAr emperumAn there and received all honors from the emperumAn. He then reached his thirumALigai and invited his nephews kIzhai agathu AzhwAn and mElai agathu AzwAn, explains them about the special mercy he got from AzhwAr and the divine form AzhwAr showed in his dream. They both became astonished hearing about this and were satisfied that they got some how got related to such mahAnubhAvar (great personality). After that, nAthamunigaL was teaching dhvaya mahA manthrams meanings through thriruvAimozhi to his dear sishya thirukkaNNamangai ANdAn (who is very well qualified to be a proper sishya). During "poliga poliga" (thiruvAimozhi 5.2.1) pAsuram, nAthamunigaL explains the divine words of AzhwAr and the incidents seen in his dream. Hearing this thirukkaNNamangai ANdAn mentions that "I am so fortunate to have the sambhandham of dhEvarir who has seen the divine form of bhavishyadhAchAryan in your dream". After that nAthamunigaL explains the same to uyyakkoNdAr, kurugai kAvalappan and his own son Ishwara munigaL. He instructs kurugai kAvalappan to practice ashtAnga yOgam, uyyakkoNdAr to lead the sampradhAyam and Ishwara muni to name his soon to appear son yamunai thuraivar. During his final days, he invites uyyakkoNdAr, asks him to take a vow of not revealing this to every one, presents the bhavishyadhAchAryan vigraham to him and tells him to present the same to the future son of Ishwara munigaL at the right time saying that this vigraham is the object of adoration of nAthamunigaL himself and to fully depend on that great personality. Meditating on that vigraham and saying "AzhwAr thiruvadigaLE sharaNam", nAthamunigaL ascends to paramapadham and becomes a part of the adiyArs in nithya vibhUthi. 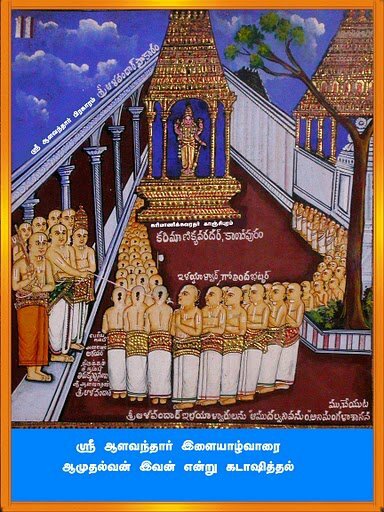 While uyyakkoNdAr along with other sishyas of nAthamunigaL happily propagating the sampradhAyam, once while maNakkAl nambi and thiruvallikkENi pAN perumAL arayar who are the sishyas of uyyakkONdAr were learning thiruvAimozhi from their AchAryan, during "poliga poliga" pAsuram, for "kaliyum kedum", uyyakkoNdAr explains to them all the incidents that are learnt from nAthamunigaL. Astonished at hearing this, maNakkAl nambi and thiruvallikkENi pAN perumAL arayar said who is going to get the great benediction of seeing such bhavishyadhAchAryan like nAthamunigaL? uyyakkoNdAr informs them that when such bhavishyadhAchAryan appears the whole world will surrender unto him and every one will have to have his relationship. In his final days, he invites his prime sishya maNakkAl nambi (who fully served him for 12 years), he again explains the incidents to him again. When nambi asks him who is going to lead this sampradhAyam after uyyakkoNdAr, uyyakkoNdAr nominates nambi himself who is a direct sishya of himself. He also informs nambi that Ishwara munigaL will have a child soon in the sottai kulam (srEshta kulam of nAthamunigaL) and after that we need not worry since yamunai thuraivar will identify the bhavishyadhAchAryan to lead the sampradhAyam to great heights as foretold by nAthamunigaL. He then presents the bhavishyadhAchAryan vigraham to maNakkAl nambi and tells him that he was unfortunate not to have given that directly to yamunai thuraivar (since he had not born yet) and asks him to present the same to yamunai thuraivar saying that this was very dear to nAthamunigaL (his grandfather). He also asks nambi to explain the background of the bhavishyadhAchAryan vigraham to yamunai thuraivar. Subsequently maNakkAl nambi goes to yamunai thuraivar who is taking care off administrative duties and reforms him (this can be read at http://guruparamparai.wordpress.com/2012/08/25/manakkal-nambi/). He then brings ALavandhAr to srIrangam and as per the orders of uyyakkoNdAr, explains all the rahasya meanings of our sampradhAyam and the background of bhavishyadhAchAryan's appearance. He instructs ALavandhAr to lead the sampradhAyam with many srivaishNavas and ALavandhAr obliges as such. During his final days in this leelA vibhUthi, nAthamunigaL appears in the dream of maNakkAl nambi and tells him "to go and search for the bhavishyadhAchAryan who has appeared and will uplift the whole world and also present the bhavishyadhAchAryan vigraham to ALavandhAr which is very dear to me". nambi asks him "Why nAthamunigaL instructs him to do this?". nAthamunigaL replies that "My heart will be very pleased when my grand son ALavandhAr sees this bhavishyadhAchAryan directly whom I only saw in my dream". Realising what happened in his dream, nambi becomes astonished by the events and is very pleased that by the causeless mercy of nAthamunigaL he becomes the messenger to do this. At that time ALavandhAr arrives to meet nambi and nambi tells him "Your grandfather out of his causeless mercy, appeared to me and asked me to convey this secret message to you" and explained the whole incident. Hearing this, initially ALavandhAr becomes saddened that he did not get it directly (thereby he would have met his grandfather nAthamunigaL), but then becomes very pleased since he got it through his dear AchAryan. nambi then presents the bhavishyadhAcharyan vigraham to ALavandhAr and tells him that "this is very dear to your grandfather and he asks you to fully depend on this bhavishyadhAchAryan vigraham, you ensure that his avathAra rahasyam is kept secret. You are going to meet and identify this person as the next leader of our sampradhAyam and he will take our sampradhAyam to great heights". ALavandhAr subsequently leads our sampradhAyam from srIrangam and takes care off the vigraham very nicely and secretly. Like maNakkAl nambi instructed, he starts looking for the great AchAryan and since he was unable to locate him, he becomes very saddened. At that time he hears about iLayAzhwAr's charithram from some srivaishnavas and visits perumAL kOil (kAnchipuram). Through thirukkachi nambi, ALavandhAr sees iLayAzhwAr at kariya mAnikka perumAL sannidhi and also verifies his thirunakshathram to be thiruvAdhirai. Since all 3 conditions match (his greatness, his physical appearance matching the vigraham and his thirunakshathram based on AzhwAr's own words), he decides that iLayAzhwAr is the bhavishyadhAchAryan and blesses him with his katAksham and declares that "Am mudhalvan ivan" (ஆம் முதல்வன் இவன்). In his final days, he invites thirukkOshtiyUr nambi, presents the bhavishyadhAchAryan vigraham to him and explains the background fully. He also informs him that bhavishyadhAchAryan is none other than iLayAzhwAr who has appeared as the shining light of the prapanna kulam to uplift everyone and asks him to teach all the rahasya meanings to iLayAzhwAr. He also says our dharisanam will eventually be popularly known by his name as emperumAnAr dharisanam or rAmAnuja sampradhAyam. At his last moments, when all the srivaishnavas request him to give them valuable instructions, ALavndhAr says he has identified iLayAzhwAr as the next AchAryan (based on nammAzhwAr thiruvuLLam) and is leaving to paramapadham with a heavy heart saddened by the fact that he did not have the association of iLayAzhwAr. Thus all the AchAryas before emperumAnAr declared that emperumAnAr is the uththAraka AchAryan. How is it possible to say that emperumAnAr is the uththAraka AchAryan for the AchAryas before him? The following slOkam is in varAha purANam which explains how the pithrus in the pithru lOkam will be happy to see a vaishnavan in their family and treat him as the opportunity to uplift them as well. Even though the pithrus are in a different (pithru) lOkam already, when a vaishnava appears in their family they treat him as his deliverer. nAthumunigaL, etc are already in paramapadham. But when AdhisEshan who is the leader of nithyasUris appeared in prapanna kulam as iLayAzhwAr, there is nothing contradictory in accepting him as the deliverer. This is explained further in the next section. But the next question here is, for pithrus in the pithru lOkam, since they dont have vaishnavathvam (by the fact that they are in pithru lOkam) and for them also the ultimate destination is paramapadham, they need a vaishnavan who can be a deliverer. So, there is no question that they consider a vaishnavan in their family (who appears after them) as their deliverer. But for nAthamunigaL, etc., they themselves are leaders amongst vaishnavas and have also reached the ultimate destination paramapadham. So, they dont need a deliverer anymore and it seems contradictory that they consider bhavishyadhAchAryan as their deliverer. No, it is not so. For nAthamunigaL, nammAzhwAr is the uththAraka AchAryan (deliverer) - there is no doubt about that. Even though nAthamunigaL has complete faith in AzhwAr's lotus feet as his upAyam, since AzhwAr himself identifies bhavishyadhAchAryan (iLayAzhwAr) as a part of himself similar to lakshmaNan is identified as srI rAman's right hand (rAmasya dhakshiNO bAhu:). AzhwAr also said "Since I am the origin of this great person, he will be considered as my lotus feet", nAthamunigaL becomes firmly situated on AzhwAr's words and develops great attachment towards bhavishyadhAchAryan. He gives this secret knowledge to uyyakkoNdAr, uyyakkoNdAr to maNakkAl nambi, maNakkAl nambi to ALavandhAr and ALavandhAr to his sishyas - periya thirumalai nambi, thirukkOshtiyUr nambi, thirumAlai ANdAn, periya nambi, thiruvaranga perumAL arayar, etc. As per "kodumin konNmin" (கொடுமின் கொண்மின்) (thirumAlai) and thasmai dhEyam thathO grAhyam (gAruda purANam) meaning my bhakthan who has 8 qualities [1) unconditional love for bhakthas of emperumAn, 2) enjoying (others) worship of emperumAn, 3) worshipping emperumAn him/herself, 4) being without any pride, 5) having attachment in listening about emperumAn, 6) having bodily changes (like goose bumps, etc) when hearing/thinking/speaking about emperumAn, 7) always thinking about emperumAn, 8) not asking material benefits in return for worshipping emperumAn] is most worshippable like myself and one should give and accept knowledge from him, these prime sishyas of ALavandhAr wanting to have their sambandham established with udayavar, established AchArya sambhandham towards emperumAnAr (i.e., became emperumAnAr's AchAryans), made their own children to become the sishyas of emperumanAr and considered their children's relationship to emperumAnAr is greater than their own relationship with their children. Just like when emperumAn accepted gaNtAkarNan, it also favoured gaNtAkarNan's brother who did not even surrender to emperumAn. When emperumAn accepted vibhIshaNAzhwAn, the four rAkshasas who came with him also benefited with the same result. When prahlAdhAzhwAn was accepted by emperumAn, emperumAn's mercy reached to prahlAdhAzhwAn's relatives also. The same way iLayAzhwAr's 5 AchAryas considered that their children should also have sambhandham of emperumAnAr. If we can observe that emperumAn who is common for both bandham and mOksham (based on ones own karma and prapathi) will give his mercy to all the relatives of the ones who surrendered to him, what to speak of emperumAnAr who is only focussed on giving mOksham to everyone who desires for that. For these AchAryas to depend on emperumAnAr who appears after them in guru paramparai, nAthamunigaL's words are the foundation. These 5 AchAryas became AchAryas (based on ALavandhAr's instructions) to emperumAnAr just to establish emperumAnAr's link in the guru paramparai. AchAryathvam is of two types - uththAraka AchAryathvam (uplifting the sishya from samsAram) and upakAraka AchAryathvam (connecting the sishya to an AchArya who will uplift them from samsAram). These 5 AchAryas of emperumAnAr only have upakArakathvam, since they connect udayavar with nammAzhwAr through the guru paramparai. If they themselves had uththArakathvam they would have themselves performed samAshrayaNam to their children - instead they got them to surrender to emperumAnAr who is the lotus feet of nammAzhwAr - thus having uththArakathvam in full. In the next article we will continue to see the next section where uththAraka AchAryas are explained in detail. Original text of this grantham can be read at: https://docs.google.com/open?id=0ByVemcKfGLucS1NQajNnR04yeDg. All articles of this series can be read at: http://ponnadi.blogspot.in/p/charamopaya-nirnayam.html. archived in http://ponnadi.blogspot.in, also visit http://guruparamparai.wordpress.com. Please view Reader's guide first to have a better understanding of these principles. For questions/comments/feedback, please contact sarathy.thothathri@gmail.com. thathva thrayam - Iswara - Who is God? thathva thrayam - chith - Who am I? Contact Sampath swamy at 9790923211 or sampath.thothathri@gmail.com for daily updates on srIvaishnava sampradhAyam related uthsavams, events, daily short messsages, etc in your finger tips i.e., in the mobile phone. Engage your children in playing a divine card game which will help them memorize details about each dhivyadhEsam and the AzhwArs and at the same time immerse themselves in the thought of srIman nArAyaNan and his divine abodes. Can be a great gift as well. Contact Sampath swamy at 9790923211 or sampath.thothathri@gmail.com for further details.